GOKPOP | Exclusive K-News in Malaysia & Singapore: 2pm's Nichkhun is coming to Malaysia on 3 July to promote his upcoming Thai Movie "Brother of the Year"
2pm's Nichkhun is coming to Malaysia on 3 July to promote his upcoming Thai Movie "Brother of the Year"
Great news to all Malaysian Hottest as 2pm's Nichkhun is coming to Malaysia in early July! Today, GSC announce the main actors of the upcoming Thai movie 'Brother of the Year' will be coming to our shores on 3 July for the special screening at GSC Mid Valley. Guess what, the main lead who are coming is our favourite actors Sunny and Nichkhun. 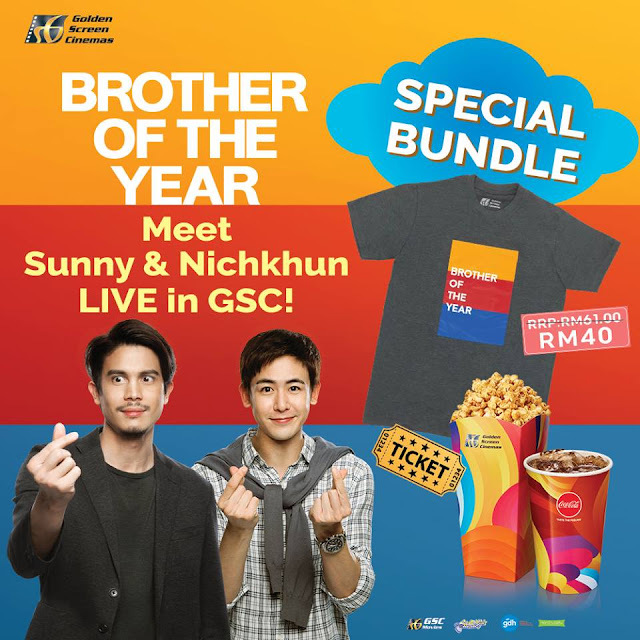 By purchasing "Brother of the Year" movie ticket at RM40, you will stand a chance to meet Sunny and Nichkhun up close and able to walk-away an exclusive movie T-shirt, with a free combo 1. But sadly within hours after GSC announcement, the movie tickets are officially sold out. If you didn't manage to grab a ticket, no worries, as 'Brother of the Year' will be screening in all GSC cinemas starting from 28 June.